In the next century, the United States and Russia have joined forces to form the International Peacekeeping Force. The IPF is charged with controlling the satellite network and preventing nuclear missile launches. But many factions resent this orbital police force - and attempt to seize control of the satellites.... and the IPF itself. Old school Ben Bova story is new again! In a startling future that's coming closer every year, Chet Kinsman is an astronaut ace who has done everything one can in space - including commit the first murder. It's a secret he can never escape, not even on the moon, where he's head of the first U.S. lunar colony. A series of shocking yet strangely inevitable circumstances will force Kinsman to confront his hidden past and decide Earth's destiny. In a desperate countdown to nuclear annihilation, Kinsman will struggle against a deadly dilemma: if he rescues the world, he risks destroying himself. Despite Mercury's desolateness, there are still those who hope to find diamonds in the rough. Saito Yamagata thinks Mercury's position will make it an ideal orbit point for satellites that could someday create enough power to propel starships into deep space. He hires Dante Alexios to bring his dreams to life. Astrobiologist Victor Molina thinks the water at Mercury's poles may harbor evidence of life, and hopes to achieve fame and glory by proving it. Bishop Elliot Danvers has been sent by the religious sect, "The New Morality", to keep close tabs on their endeavors, which threaten to produce results that contradict biblical teachings. 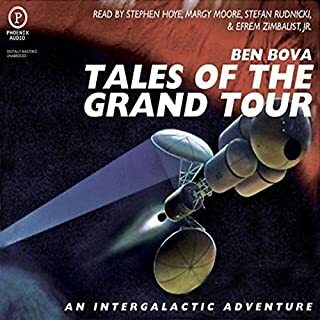 I've now read or listened to all of Dr. Bova's "Grand Tour" series and "Mercury" is second only to "Saturn" in my book. It has all the great themes and characters you expect from Bova, deftly exploring what some see as the un-avoidable conflict between science and religion, and others may view as nut cases versus normal people (you decide which is which). It's a little faster paced than "Saturn", and there are a few of the same characters (unfortunately no Poncho Lane in this book). The recording technique of using 3 or 4 different voices really adds drama and atmosphere to the narration. Overall very entertaining as well as thought provoking. 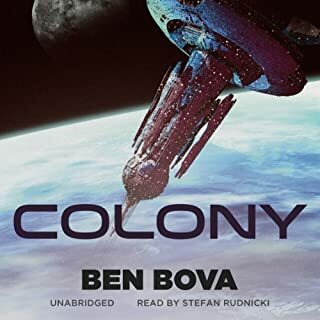 Ben Bova has become one of my favorite Science Fiction writers. 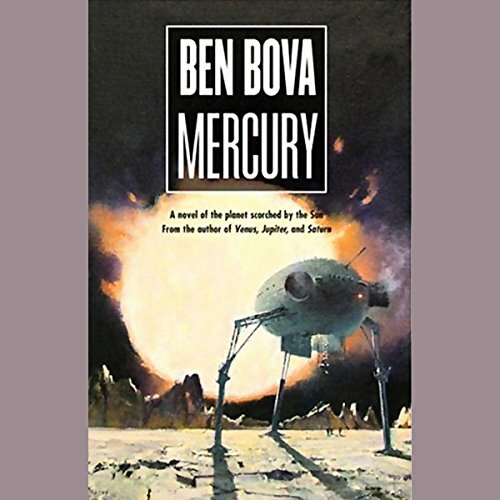 Mercury, like many of Ben Bova's other books, is written around the same future history and events (e.g.,Saturn, Jupiter, etc) but is mostly about other topics and event and not so much about the planet Mercury itself. The motivation for the main character was revenge, which I found too shallow a motivation for such an otherwise intelligent character, but overall, the books themes and events kept me listening to the end. I'd have preferred a better set of outcomes, but I didn't write the book so didn't get to choose the endings. I'd read this book again if I had it to do over again. No.. There's not a lot of laser blasts and desperate daring-do, but it's mature science fiction for those of us that enjoy the real life "Grey areas" of human character, and thinking about what is possible in the not-so-distant future. As in real life, there is no clear-cut good and evil, and you start out feeling one way, change what you may have believed about midway, and then change your mind again at the end... It's not some mushy "And they lived Happily ever after" story, as so many stories are... it shows the fallible nature of humans, their grand achievements, and their capability for evil. 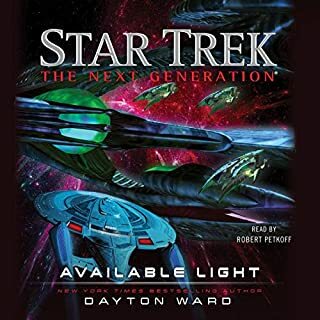 If it were a paper book, I'd say it was a "page turner"... but since it was an audio book, I found myself wishing they'd read faster in many parts. The innocent aren't so innocent, and the guilty may not be so guilty, or maybe more than guilty, depending on your personal point of view. I have to say, I was not a big fan of Bova in his early years, but I've yet to listen to a more recent book that has left me wanting. 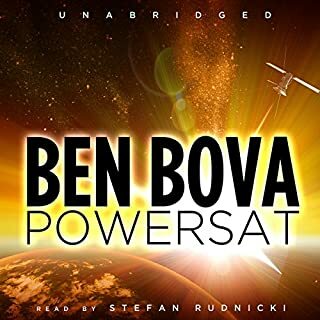 I may have to get "Saturn" despite some of it's poor customer reviews, since the rest of the books in the series have provided me MANY hours of entertainment, and that's ultimately what it's all about..
Would you try another book from Ben Bova and/or the narrators? Of course. I am now addicted to the series. Between Ben and Stefan,it's a wonderful journey. Most likely will get to hearing them all. More on Mercury, less high school jealousy. Yes, and Stefan is wonderful on this one. He is rivaling Hill and Brick in my heirarchy of performers these days. Do you think Mercury needs a follow-up book? Why or why not? Well, we heard alot more about the SkyTower, and not nearly enough about Mercury, so, in that context, yes, we do. The series tends to be rather derivative and repetitive, BUT the characters and plotlines, connected as they are, are compelling enough to keep the listener caring and connected. This is not the best, but it is does add to the series in many ways. Recommended. I have read (and liked) lots of Bova's other books, but this one left me cold. The plot is preposterous in places, full of holes in others. The characters are mostly very two dimensional and their motivations are sketchy at best. Some of the science is interesting but the story did nothing for me. I thought that a book called Mercury would actually be about Mercury. But, the planet only takes a small portion of the book's length. The rest is a revenge plot, most of which unwinds in flashback. Is it a tragedy or a love story, or both? The plot has shades of twisted romantic love, career, greed, and religion gone awry. In the end, i found myself looking for the Count of Monte Christo. I got this book for two reasons: 1. Bova's book Venus had a scene in it that actually made me feel that I was in the atmosphere of Venus. 2. Mercury seems to be the forgotten planet, few people ever write about it, so I wanted to learn more about it. As it turns out this book is a soap opera and only about 1% of the story takes place on Mercury. Instead it is a story about a space elevator built on Earth. I guess Bova did not believe Clarke (several times), Robinson, Benford, Fortschen, Reynolds, Steele, McDevitt, Niven, Sawyer, Heinlein, Baxter and many others had done a good enough job writing about space elevators, he had to spend the majority of his book, supposedly about Mercury, writing about a space elevator on Earth. He could not even do like Robinson did and build it on the planet in question. To prove this saying, Bova has one of main characters have so many good luck consequences that have to happen to make the soap opera continue happen that it will make your head spin. He follows this up by making another main character be so stupid it is annoying and he has to be stupid for the so called plot to go forth. He gets an anonymous e-mail from someone about an important science discovery and he does not think twice about it be anonymous. He does not even think about why it was sent to him, a fairly unimportant scientist. His wife says she has gotten a lot of love letters from him, which he sent none, he does not question this either. Most Bova book reviews go on about his science credentials, yet he often writes soap operas instead. Usually there are lots of science to go with the poorly written drama. This book does not even do that. There is some science that is inserted like readings from a dictionary. So, if your interested in reading another book on the space elevator being built on Earth, you might enjoy this or if you like really bad soap opera, you will love this. 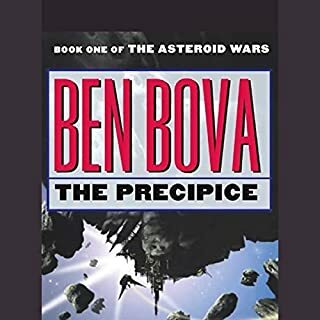 My favorite book by Been Bova thus far and one of the best science fiction stories I've ever encountered. 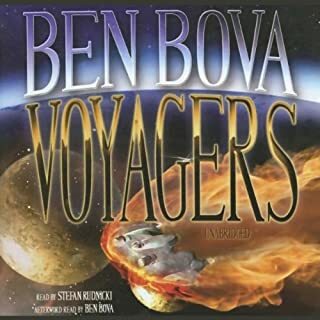 This is one of my favorite Ben Bova books. The use of three narrators was very effective. I love listening to Stefan Rudnicki - he really brings the characters to life. Arte Johnson and Moira Quirk also did very well. I was so looking forward to listening to someone read the description of the collapse of the sky tower and I was not disappointed. Someone really needs to make a movie based on this book. Can you imagine the fun the special effects team would have with the collapse of the sky tower? And how much fun it would be to watch it?! Started a bit slowly, but the twists and turns are worth the patience. Really takes you through the whole gamut of emotions with the characters. This book was brilliant, another great novel by the most excellent Ben Bova. I initially thought that this would be rather dull, but the author intermeshed the extreme environment of Mercury with a great story about an engineer who worked on a project that failed. I found this book very interesting, the technology totally believable and the story gripping at every stage. This was a story of revenge and its consequences. I really enjoyed this book and recommend it to other readers.